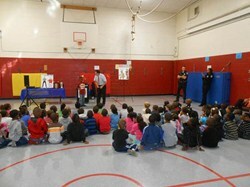 Rowland students in first through third grade participated in a very valuable public safety assembly this month. The assembly was part of the Officer Phil Program. The Officer Phil, Deputy Phil and Firefighter Phil Safety Programs teach children about stranger danger, the negative effects of bullying, fire safety, Internet safety and respect for authority figures. The assembly also encourages positive behavior like honesty, friendship, being a buddy not a bully, civic responsibility and knowing what to do in an emergency just to name a few. The students were treated to magic, games and ventriloquism during this fun, entertaining and informative thirty minute live assembly. A special thanks to South Euclid Police Officer Singerman and Dispatcher Flanagan, who assisted with the assembly.